Tree spraying treats many of the pests and diseases and make your yard look healthier. Some tree spaying companies suggest how you can cure all issues with trees like this, but unfortunately, that just isn’t the truth. Specialists spray trees to eliminate specific problems with them, and you should only have this done on your Asheville property if the positives outweigh the negative effects of doing it. Why Call Family Tree Services? Experts will almost always be a better choice. Family Tree Services, a company in Asheville, understands the life cycle of the diseases and pests, and they understand the small window of opportunity for tree disease control. As one of the credible tree spraying services, we will alert you to when the window of opportunity for getting rid of these pests has passed. Unfortunately, a lot of people offering these services don’t understand the life cycle of some of the most common pests in trees, or they have no intention of enlightening the customer. Family Trees Services in NC has a deep understanding of the life cycle of each organism. We don’t apply the shotgun approach as a “one-size-fits-all” solution. We slant our approach to a technique that has a more scientifically sound reasoning. When treating problems, we set out to get rid of as many problems as possible. Imagine you visited a doctor who gives the patient pills for a variety of various diseases to prevent them. This is a lot like getting miticide, insecticide and fungicide all at the same time. The adverse consequences of doing this will likely outweigh most of the benefits of getting rid of a pest because it could turn the leaves on your tree black at the same time. What are the Advantages of Hiring Our Experts? More affordable than the competition. Uses the latest products to get rid of pests. Knowledgeable staff about when to get rid of specific pests. One of the biggest benefits to hiring Family Tree Services is the solid reputation that we have built up over the years. We have a strong foundation for excellent services and honesty. That’s important because if you hire the wrong company, they can give you damaging advice, which can actually wind up killing your tree. You have several different tree diseases that you can treat with a spray. Some of the fungal disease with evergreen trees include needle cast and tip blight. You also have Scab on crabapple trees, which you can treat with tree spaying. The fungal diseases on some of the deciduous trees can be hard to treat with a spray, but they might respond better if you choose a trunk injection instead. 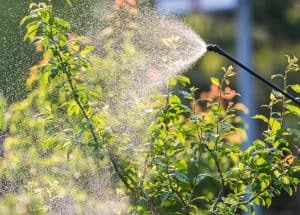 Even the diseases that you can treat through sprays will require the careful knowledge of an expert who understands the specific series of fungicide sprays to use and the best techniques for getting rid of the diseases. Family Tree Services has the knowledge on hand to help and make sure the problem goes away. As experts, we have the right knowledge about timing to get rid of the fungal infections. We will inform you if the time frame has passed to get rid of the fungal infection. Especially when you apply these sprays in a series, the timing of how you do it becomes critical if you will see a clean bill of health. We will spray several times to help you get rid of the pests. You might also choose a disease-resistant tree to begin with to lower the risk that your trees will have to fight off diseases or pests. Routine maintenance is also one of the most important practices. To give an example, you should water your trees well enough and fertilize them only as you need to. You will also have to prune the tree on a seasonal basis and consider winter protection and fall cleanup on the trees. You can’t find a tree that will be immune to pests. Every kind of tree has the common pests that will pose a threat to it. Being in the business of tree care, we understand what attacks specific trees, and we understand the best times to do a treatment on it. Whenever we go out to treat the shrubs and do tree disease control in NC, we will usually call ahead of time to let you know that we are on our way out. To complete this job safely, we request that you move the cars away from the trees, pick up dog food bowls, toys in the yard and close the windows. Basically, if you don’t want harmful spray on your possessions, pick them up. It’s much safer that way too. Get In Touch With Family Tree Services Today! We provide the very best in tree care solutions throughout Asheville & Buncombe County, North Carolina. Give us a call today for a free quote. Stay In Touch With Family Tree Services Today! All Rights Reserved. Family Tree Services. Copyright [wpsos_year]. We provide expert tree care solutions throughout Asheville & Buncombe County, NC for all types of customers including residential or commercial properties.